A reading from the gospel of John 3:1-17 (NRSV). We recently heard a portion of this reading in the lectionary text assigned for the fourth Sunday during the season of Lent. But we turn to it again on this Sunday when we celebrate the Triune God; for in this gospel reading, we begin to learn of the dynamic relationship between God often named the Father, Christ often named the Son, and the Spirit that flows between them and all who live in the very same love. Listen for God’s word to us in this reading from the gospel of John. It was wonderful last Sunday to see almost everybody present in red! Pentecost was an amazing celebration of the Spirit of God at work in and beyond us – and among this congregation that has worshipped here in this place for 60 years. If you sat near the back last week, you had the extra special treat of seeing the logo of little hands with palms of hearts reaching out. In the original symbol created by the Renewal Team, the hands are of different sizes and colors – as we see in weekly email updates, the monthly newsletter, and anywhere else we can show the Renewing Community logo in full color with red and aqua. Golden yellow and sky blue. Hot pink and lime green. Hands and hearts extended under the Hillwood Presbyterian Church name. All to show any who see that this group of diverse believers is about reaching out in love. Serving God by serving others – our hands the literal extension of the compassionate care of Christ that resides within our hearts. Logos are important. Images capture truths that resonate in places deeper than our rationale minds. Words are wonderful too. But a really good logo is universal. Everyone, anywhere in the world, at any time in history, has a shot at catching the meaning behind a well-crafted logo. Companies today know this and seek to create logos that will motivate buyers to get on board. When northern and southern Presbyterians re-united in 1983, one of the first things our denomination, the newly formed Presbyterian Church (U.S.A.), did was create a logo. Which happens to be right at the bottom of the spine of the hymnal. It too originally was designed in color. The cross all in deep blue. The flames at the foot of the cross in red. Looking closely – even at the one in all silver, we can see the logo is one image having various parts. The Office of the General Assembly’s official information about the logo states: “The seal of the Presbyterian Church (U.S.A.) is a symbolic statement of the church’s heritage, identity, and mission in contemporary form. Its power depends on both its simplicity and complexity, as well as its traditional and enduring qualities” (http://oga.pcusa.org/section/stated-clerk/stated-clerk/seal/). I guess we wanted all to remember that Christian faith really is quite simple – it all boils down to love. While at the same time it is incredibly complex; for discerning loving actions in every situation of our lives is not always readily clear. The GA’s description continues. “The dominate structural and theological element in the design is the cross – the universal and most ecumenical symbol of the Christian church. The cross represents the incarnate love of God in Jesus Christ and his passion and resurrection” (Ibid.). I could go on to tell about the horizontal section of the cross which you might recognize to be an open book. With a descending dove as a reminder of the Holy Spirit’s role in inspiring and interpreting the Scriptures. Then there’s the main body of the cross in which some see a pulpit or lectern, which has had a central role in communal worship for us. And the flames at the ground of the cross which remind some of the flames of the bush that was burning in the desert when Moses stepped aside to discover the land on which he was standing was holy – then to be called into God’s service. Others see in the flames the first Christian Pentecost that reminds us that amazing things happen when God’s people come together. Deliberately the seal of the PCUSA is a logo with diverse images – able to communicate multiple meanings, and more and more the deeper one looks. Which in essence is what it means to be a part of the Presbyterian Church (U.S.A.). Our historic roots and contemporary expressions of faith remind us that we are a body of diverse individuals – with unique viewpoints – expected and appreciated, as long as we all keep growing deeper into the truth the Spirit reveals in the journey of our lives. “This is who we are,” our logo declares. Others who wish to be a part of this kind of Christian journey are encouraged to get on board! To let the truth of the image manifest a little bit more in our lives each day. God also has a logo. A defining image that shows the world what God is all about. Perhaps you’ve seen it. Though, to our detriment, we tend to use the words more than the symbol – fooled into believing it takes words; when the image, universal, is what will unite. We call God’s logo the Trinity – and give it this day as a special time to remember it. Like the simplicity and complexity of the PCUSA’s seal; God’s logo, the Trinity, really is quite simple and will take a lifetime to figure out. Likewise, it’s one image, with three distinct parts. Though as the Church we’ve spent what seems like an eternity trying to understand the substance of each individual part – not to mention how three distinct things can be one, the point of God’s logo is to show us what seems invisible to the naked eye. The point of the Trinity is to show us that which is between. The flow from one to another to the other. The WAY in which the three relate – in fact, that they relate! That God is relationship itself. Throughout time, the most accurate images of God’s logo have been depicted in circles – the shape which has no beginning and no end. The circle of God’s logo has been beautifully captured in icons, carvings, and living relationships. Perhaps you have experienced it daily in the flow of self-emptying and in-filling between you and your beloved. A circle of two that creates a third – something greater than each part moving between. Perhaps you’ve seen God’s logo in the classic symbol of the Church: three intertwined circles – overlapping in a united center. Three circles of same shape and size coming together as one – which, when constructed mechanically, would lead to movement. All three circles spinning clockwise to create great power. It might be why some today envision a water wheel when they think of the Trinity. Like the water wheels of grain or saw mills that are propelled by nothing but one bucket of water outpouring into the next to fill it up only to be outpoured again into the next and round and round it goes. A visual depiction of what it looks like to live the Way of Christ. If you’ve been in the media room recently where we’ve been holding the Sunday School Class on The Trinity: The Shape of God; perhaps you’ve seen the icon of Andrei Rublev’s famous 15th Century depiction of God’s logo. In the icon, entitled the Holy Trinity, three figures that look like graceful human beings are sitting around a table. There’s a place for a beautiful figure in a golden cloak. A place for one whose mud-colored tunic is draped in the color of the seas and skies. And another wearing a vibrant green robe. Each face has a humble expression – relaxed with heads bowed to one another. The body language of all clearly leans inward as if willingly being pulled in by the others. The table is empty but for one common bowl and a hand of each slightly outstretched to the center. As a logo depicting God, we can see that the Triune God is a circle of love – a table of great sustenance. It even has a spot in the circle for the one gazing upon it. Those who study such things believe the rectangle on the side of the table, that has traces of glue on it, once held a mirror in which the one looking at the icon would see their own reflection. Thus showing the world that God’s Trinity logo invites the viewer in – into the circle of love. Into the dance of mutuality. 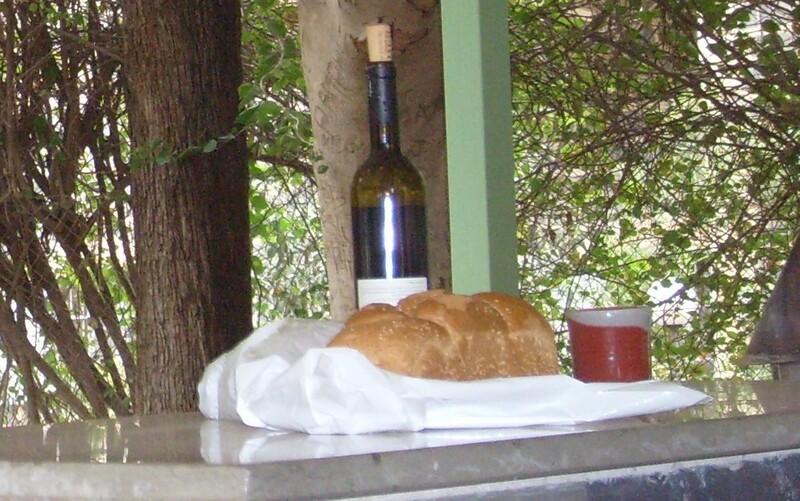 Into the great feast – the eternal banquet of God. The gospel of John declares: God so loved the world, God gave (John 3:16). The Father, the Son, and the Spirit thus have been working together. The circle of Love where all they can do is give. Give for the Life of it all. . . . It took the Church three centuries after Christ’s death and resurrection to figure it out – to search Christ’s words in order to construct an accurate depiction of God’s logo. The One that is Three. The Three mutually united as One. The Triune relationship that is God. . . . Not everyone appreciates God’s logo, or even believes it to be true. Nonetheless, the universal image stands. God’s logo: inviting all to get on board. Praying the truth of the Trinity manifests a little bit more in our lives each day. Until what is seen in us is what is seen in God, the One who in full is Love. This entry was posted in Sermons and tagged 27 May 2018 sermon, Circle of Love, John 3:1-17, Mutuality, PCUSA, PCUSA logo, Presbyterian Church (U.S.A.), Presbyterians, Renewing Community, Rublev's Trinity Icon, sermon for Trinity Sunday, The Trinity, The Triune God, Trinity Sunday Sermon, Water Wheel of the Trinity on May 29, 2018 by RevJule.